Pure luxury – superb frontline villa directly at the Sea! This newly built villa of the absolute luxury class is located in a quiet location of Son Veri Nou frontline to the Sea. 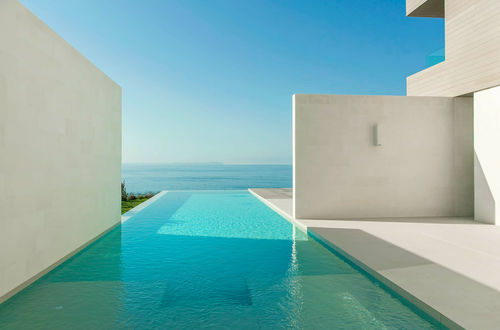 It impresses with a modern, clear architecture, best construction quality and an elegant timeless interior. Spacious rooms, glazed fronts that can be fully opened and natural materials harmonize perfectly and create a perfect feel-good ambience. All this is topped by the stunning view over the sea! 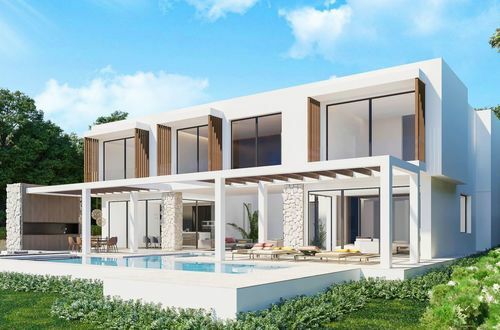 With open windows in the spacious living/ dining area with open ultramodern kitchen, indoor and outdoor areas merge into a single Mediterranean living space. Discover several open and covered terraces, a subtropical garden and the beautiful Cascade Pool. The sleeping area on the first floor with five rooms, all with en suite bathrooms offers enough space for family and friends. On the roof of the house you will find a large roof terrace with a fabulous 360 degree view - here you can enjoy magical sunrises or impressive sunsets. The villa is located on the beautiful car-free promenade of Son Veri Nou, ideal for walking and cycling. Some restaurants, cafes and shop are within walking distance and the nearest beach is only a ten minutes` walk away.